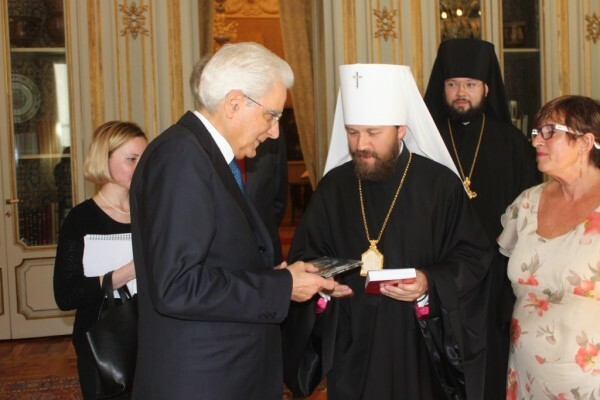 On 25 June 2015, Metropolitan Hilarion of Volokolamsk, chairman of the Moscow Patriarchate’s Department for External Church Relations (DECR), met with the President of the Italian Republic, Sergio Mattarella. Taking part in the lengthy talk, which was held at the Quirinal Palace in Rome, were H.E. Sergei Razov, Ambassador of the Russian Federation to the Italian Republic, and archimandrite Antony (Sevryuk), secretary of the Administration of the Moscow Patriarchate’s parishes in Italy. Discussed was a wide range of issues of mutual interest. Metropolitan Hilarion conveyed to President Mattarella greetings and good wishes from His Holiness Patriarch Kirill of Moscow and All Russia and said that good and constructive relations with Italy, a country with deep Christian roots, are a priority in the external activity of the Russian Orthodox Church. The DECR chairman told the President of Italy about peace and humanitarian initiatives taken by the Russian Orthodox Church in rendering help to those suffered during military actions in the eastern regions of Ukraine. Metropolitan Hilarion underscored that the Moscow Patriarchate did anything possible to call the confronting parties to the peaceful settlement of the conflict while distancing itself from any attempts to involve the Church into political strife. Metropolitan Hilarion touched upon the situation in the Middle East where genocide of Christian population continues. He emphasized the importance of common efforts of religious leaders, including those of traditional Islam, aimed at bringing to notice of the world community the persecutions against Christians, more large-scale and cruel than ever perpetrated in the last centuries. The DECR chairman described the relationship between the Roman Catholic Church and the Russian Orthodox Church, expressed satisfaction over their positive dynamics and shared his impressions of the meeting with Pope Francis. Metropolitan Hilarion also told President Mattarella about the life and work of the Russian Orthodox Church in Italy where one can find over sixty parishes and communities of the Moscow Patriarchate. The President of the Italian Republic highly appreciated the part played by the Russian Orthodox Church in the inter-Christian and inter-religious dialogues. He believes that the Church can bring a significant contribution into the process of peaceful settlement of the conflict in Ukraine. Speaking about the situation in the Middle East, President Mattarella expressed his concern over the destiny of the persecuted Christians and spoke up for the even more close cooperation among different states in opposing terrorism and in defence of the rights of the civilians persecuted by the extremists.